As a mediumwave DXer and a person interested in radio in general, you might be interested in what the FCC requires of mediumwave AM broadcast stations in their day-to-day operation. A document exists, called the AM Broadcast Station Self-Inspection Checklist. The FCC has developed it to assist broadcast station management in conducting a self inspection of their station. It provides an opportunity for the broadcaster to review and correct any deficiencies associated with the operation of a station without an actual on-scene visit (and citation!) by the Commission. Some interesting entries are to be found, and I will cover them in this article. First of all, the paperwork. Stations must keep logs and records. What is the difference, you might ask? What goes into a log and what goes into a record? STATION LOGS include entries pertaining to equipment status, equipment calibration, the Emergency Alert System (EAS) and, when applicable, the recording of tower light outages. STATION RECORDS include, but are not limited to chief operator designations, equipment performance measurements and AM Directional field strength measurements. 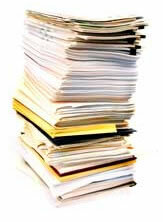 Station logs and records are to be retained for a period of two years. Station identification shall be made at the beginning and ending of each period of operation, and hourly, as close to the hour as feasible, at a natural break in program offerings. The identification shall consist of the station's call letters immediately followed by the community of license. Any reference to additional communities must be made after the community of license. The name of the licensee, or the station frequency, channel number, or both, may be inserted between the call letters and community of license. No other insertion is permissible. Simulcasted AM and FM stations may identify jointly if owned by the same licensee. Not much room for ad-lib here. Stations must identify at least once per hour on the hour, and in a strictly defined format. Exclaiming, "ESPN Radio! ", "Radio Disney 1650! ", "Power 101! ", or "K-Lite 107!" cannot be used for the official identification. They must state the station's call letters and community of license at minimum. Optionally, they may insert the owner's name, or frequency, or channel, or all of these. Finally (capitalization mine): "NO OTHER INSERTED INFORMATION IS PERMISSIBLE." What's so hard about this? A tower is a thing of beauty to the radio aficionado. Somebody even produces a tower calendar. Ah, the mediumwave broadcast tower! Think of it! Stately, striped sentinels with strobe lights flashing, they number thousands and thousands across the country, each emitting invisible waves of electrons through the late night air, spanning that mysterious thing called "the ether" to deliver communication to unknown distant masses. It conjures up thoughts of far-away points on the landscape, souls crouched in cramped corners with headsets fixed in the dark of night, straining to make sense of distant babble through static crashes and heterodynes. That would be me. The whistle of a far off freight train gives the same feeling of wonder. So, back to the broadcast tower - what is the broadcast station's responsibility? Well, any tower over 200 feet tall or even if under 200 feet and an impediment to aircraft navigation must be registered (FCC Form 854). It also must be lighted and painted. 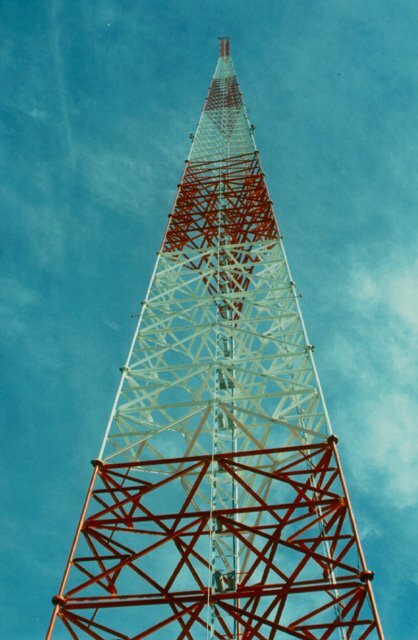 We've all seen the lighted towers of AM broadcast stations. Ever wonder about those lights? What happens when one goes out? Who checks to see if they are burning, and how often? 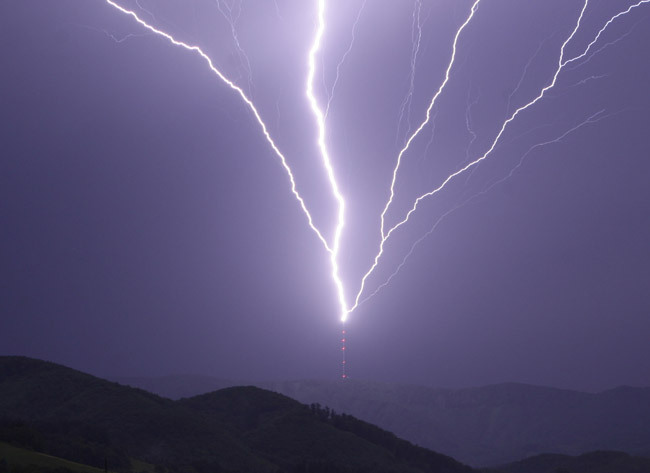 The lighting on tower structures is to be observed at least once every 24 hours either visually or by observing an automatic indicating device; or alternatively the licensee/tower owner may provide and maintain an automatic alarm system to constantly monitor the lighting on a structure. All automatic or mechanical control devices, indicators, and alarm systems are required to be inspected at intervals NOT TO EXCEED 3 months. Relief here, maybe, for the engineer. As of 1996, responsibility for tower lighting (and painting) lies with the owner of the structure, not necessarily the station licensee. However, at least a human doesn't have to go outside once a day and look to see if the lights are burning. An electronic monitoring device can perform the task. However, then the MONITORING DEVICE must be inspected at least every three months! Note: A recent directive relaxes this requirement to a year. The station authorization and/or tower registration specifies the painting and lighting requirements for your operation....The licensee must make certain that the number and placement of paint bands and lighting match exactly with that shown on the station authorization and/or tower registration. The licensee/tower owner should also be aware of the requirement to clean or repaint tower structures as often as necessary to maintain good visibility to aircraft. Antenna structures shall be painted throughout their height with alternate bands of aviation surface orange and white, terminating with aviation surface orange bands at both top and bottom. The width of the bands shall be equal and approximately one-seventh the height of the structure, provided however, that the bands shall not be more than 30.48 meters (100 feet) nor less than .46 meters (1 1/2 feet) in width. All towers shall be cleaned or repainted as often as necessary to maintain good visibility. Additionally, Form 715-715A goes into great detail on the positioning and intensity of tower lights. ....One of the most common problems associated with tower painting is the feedlines that are on the outside legs of a tower. In many cases, the tower is painted correctly, but the solid black colored feedlines defeat the purpose of the painting by covering the outside legs of the tower. The licensee/tower owner should make certain that the feedlines are also painted in such instances. This does not apply in cases where the tower is authorized for strobe lighting. 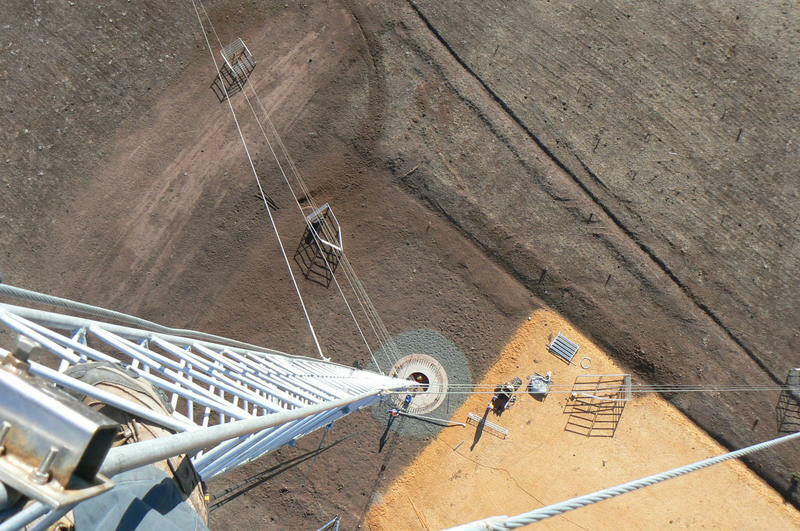 To wit: If you run your feedlines up the outside of the tower leg, paint the feedlines to match the tower striping! So that's what they call that red color on towers: aviation surface orange. Bottom line: you have 30 minutes to notify the FAA if your top tower light or one of your flashing lights goes out! Lots of rules exist about checking and maintaining station transmitter power and purity of signal. Stations are granted the privilege to transmit at a certain output power. How much leeway do they get to be over or under powered? All AM stations are to maintain antenna input power between 90% and 105% of that authorized. Interesting, we are allowed no more than 5% over and 10% under. Accordingly, a 50KW station can actually run between 45KW and 52.5KW and still be in compliance. I wonder how many 50KW stations push the envelope and run that extra 2.5KW? Or more? ....The power is to be maintained as near as practicable to the station's authorized power. In the event that it becomes technically impossible to operate at authorized power, a station may operate at reduced power for a period of not more than 30 days without specific authority from the FCC. If operation at reduced power will exceed 10 consecutive days, a notification must be sent to the FCC, Media Bureau, Washington, D.C. 20554, no later than the 10th day. If normal power is restored prior to the expiration of the 30 day period, the licensee must notify the FCC upon restoration of normal operation. It's kind of like highway speed limits. The cops will ticket you for going more than 10 mph over and let you by at 5 mph over. You will also get ticketed for going to slow on certain roadways, i.e. 35 mph in a 55 mph zone. So how exactly does a station measure its power level accurately to assure compliance with the FCC? Okay, we need to check the power. Do we just read it off a meter on the console and log it? Well, perhaps. The antenna input power of AM stations must be determined using the direct method. However, the indirect method may be used on a temporary basis when it is not possible or appropriate to use the direct method due to technical reasons. 1) Employ a suitable instrument for determining the antenna's input power directly from the RF voltage, RF current, and phase. 2) Calculate the product of the licensed antenna or common point resistance at the operating frequency and the square of the indicated unmodulated antenna current at that frequency, as measured at the point where the resistance has been determined. F = Efficiency factor of the transmitter. The value of the efficiency factor, F, is to be determined and a record of its value is to be maintained and available upon request. Licensees must make certain that all duty operators know which method of power determination is being used and how to calculate the output power based on that method. Furthermore, how does a station ensure that its signal is clean and meets prescribed standards? Not only must a station monitor power and other parameters, but it must have procedures in place on how and when to do it. The licensee must establish monitoring procedures and schedules for the station. 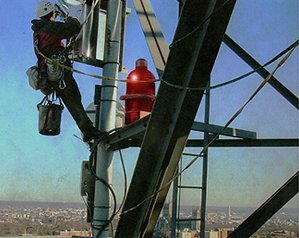 Monitoring procedures and schedules must enable the licensee to determine compliance with operating power, modulation levels, AM modes of operation, and where applicable with antenna tower lighting and AM directional antenna parameters. Licensees should be able to provide upon request made by the FCC, the monitoring procedures and schedules they have established for each station. In the event that an AM broadcast station is operating with a mode of operation not specified by the station license, then the station operation must be terminated within 3 minutes or the station output power must be reduced sufficiently to eliminate any excess radiation. This includes AM Directional stations with parameters or monitoring points out of tolerance with the station authorization. ....In the event that an AM broadcast station is operating with power in excess of 105% of authorized, or with excessive modulation, then station operation is to be terminated within 3 hours, unless corrective action is taken prior to that time. All right, it basically boils down to this: A station must have a monitoring procedure in place (obviously written), and a schedule in place for when to do it. They must monitor, at minimum, the power output, modulation level, AM quality, antenna lighting, and antenna directionality. And if their monitoring shows that they are out of compliance, they must shut down within three minutes, or at least reduce power to bring them back into compliance! The only exception is if power is exceeded or modulation is excessive - in which case they have three hours to terminate operation. 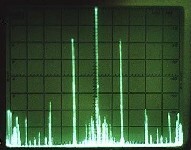 A station is licensed to transmit on a specified frequency. Along with measuring power output, a station must also ensure that it is on frequency. How accurate is it required to be? The carrier frequency for monophonic transmissions or the center frequency for stereophonic transmissions may not depart more than 20 Hz from the assigned frequency. Tune across the broadcast band some night when conditions are good and listen for heterodynes. On any given channel there should be none, ideally. You have to listen carefully. 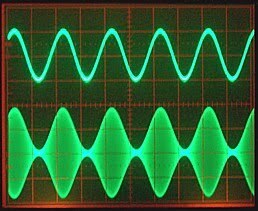 Listen for that faint, low "whump, whump, whump" beat note caused by one station being ever so slightly off frequency, usually only a matter of cycles. 20 Hz offset is too low to hear as a tone. It is more of a rapid, dull thump-thump-thump, 20 times per second. If you hear a tone, a station is way off frequency, much more than 20 Hz (cycles). Surprisingly, you will find some. In no case shall the amplitude modulation of the carrier wave exceed 100% on negative peaks of frequent recurrence, or 125% on positive peaks at any time. Slight over-modulation on the positive portion of the waveform is sometimes used for a more punchy sound, and works within limitation. Any time you exceed 100% modulation on the negative portion of the waveform, it is clipped because you can't have less than zero carrier signal; that clipping generates high order harmonics that cause sidebands far outside of your intended channel and will interfere with other stations above or below the operating frequency. Back to station output power again. If a station's service is not "Unlimited", it will generally be required to operate at different power levels for daytime, nighttime, and possibly even during the "Critical Hours" period. Critical Hours are the first two hours of daylight after sunrise and the last two hours of daylight before sunset. Most AM stations utilize more than one power mode of operation. In addition to the normal authorized daytime power many stations operate under the reduced power pre-sunrise service authorization (PSRA) and post-sunset service authorization (PSSA)....Some stations will have reduced power nighttime operating authority and a few stations have a specified critical hours reduced power authorization. The times when power changes are to occur are clearly shown on the station authorization and in readily available sunrise/sunset tables. (See http://www.fcc.gov/mb/audio/bickel/srsstime.html for a table of the sunrise/sunset times for your area). Any unauthorized departure from an operating schedule will be considered as a violation of a material term of the license. It is the responsibility of the licensee to maintain calibrated time keeping devices, power switching devices and other equipment necessary for the timely change in power to occur as authorized. In addition, should the station be operated with more power than authorized for that time of day, then all operation is to be terminated within 3 minutes. 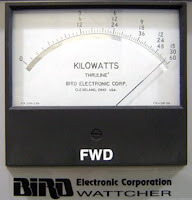 The logging of power mode changes is not required unless the station is operating out-of-tolerance with any operating parameter. However, licensees are encouraged to do so. As already stated, the FCC is very specific on power changing. Stations must keep accurate timing and change their power accordingly and on time. They must determine (on their own), their local sunrise/sunset time and change power precisely at that time. If they are out of tolerance by as little as three minutes, THEY MUST SHUT DOWN OPERATION. This is a stringent requirement. Violation of this requirement is a violation of the terms of their license. I would venture a guess that there are more than a few stations that are not changing power exactly on time. I know of some locals that are most definitely not within the three minute window. So there you have it - the FCC's basic checklist on how to run an AM broadcast radio station. Hope you enjoyed it. I suspect the FCC could get a bunch of money in fines from all of those Disney and ESPN stations that don't ID. Yes, too bad there isn't more enforcement. Who said ESPN and Disney don't ID? "AM 1110, KDIS, Pasadena, Los Angeles!" "This is KDIS and KDIS-HD, Pasadena, Los Angeles!" "AM 1580, KMIK, Tempe, Phoenix!" "This is KMIK and KMIK-HD1, Tempe, Phoenix!" "KKDD, 1290 AM, San Bernardino, Radio Disney!" "Equis E Ese Pe Ene, Ochocientos A Eme, Tijuana, Baja California, Mexico"
I also have heard KSPN Los Angeles identify, but don't remember exactly how they do it. Must be a local thing. They sure don't like to ID out this way!